Valves are linear, with subcapitate to capitate apices. Valves are small and lightly silicified. The axial area is linear and narrow. 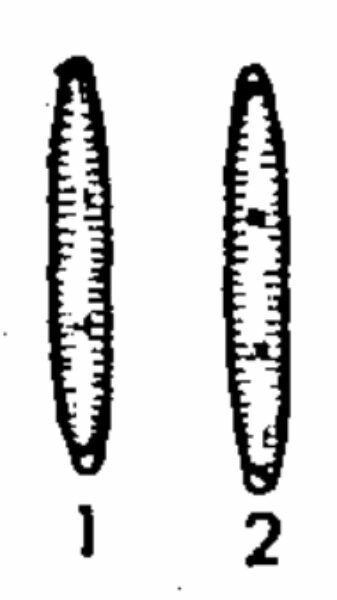 The proximal raphe ends are distantly placed. In light microscopy, the proximal raphe ends are distinctly thickened. Striae are parallel in the center of the valve, and slightly convergent near the apices. Each stria is composed of a single elongate areola. In girdle view, frustules are narrow, nearly rectangular and the thickened proximal raphe ends are clearly visible. This small, rare taxon has likely been overlooked or included with species of Achnanthidium, or perhaps Berkeleya rutilans in surveys of North American rivers. Krasskella kriegeriana has been found as rare taxon in Higgins Pond, Cape Cod, Massachusetts (Siver et al. 2005). It was also reported from South American glacial rivers (Rumrich et al. 2000), although the specimens do not conform to the type as described by Krasske (1943). In North America, K. kriegeriana is not uncommon in cold, nutrient poor rivers of the California Sierra Nevada Range. This taxon is also reported and illustrated from Michigan (Camburn and Charles 2000) and Fallu et al. (2000) from Quebec, reported as Amphipleura kriegeriana. Fallu et al. provides DOC optima (pg. 45). This taxon is included in the PIRLA Iconograph (Contrib 12, Pl 49, FIg 221) from Mud Pond, Maine with dimensions 12.5 µm in length, 1.5 µm in width and striae count of 28 in 10 µm. Camburn, K.E., Kingston, J.C. and Charles, D.F. (1986) PIRLA Diatom Iconograph PIRLA Unpublished Report Series, Report 3. - Electric Power Research Institute, Palo Alto, California. Hustedt, F. (1954) Neue und wenig bekannte Diatomeen. VI. Berichte der Deutschen Botanishen Gesellschaft 67: 269-280. 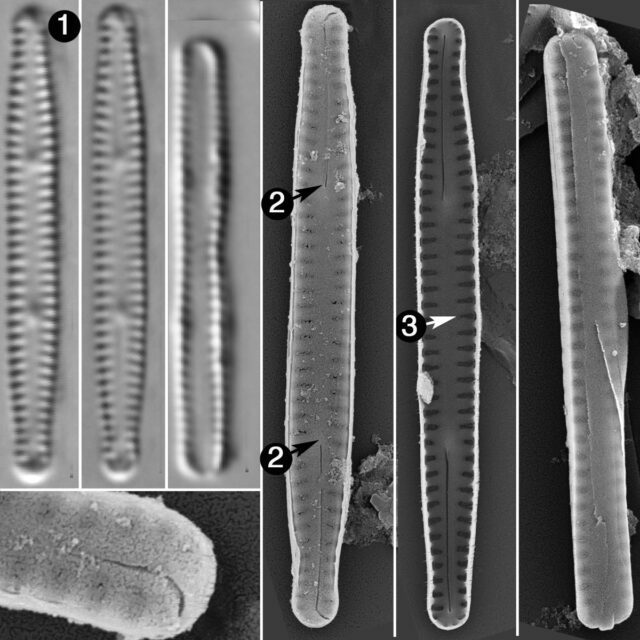 Rumrich, U., Lange-Bertalot, H. and Rumrich, M. (2000) Diatoms of the Andes. From Venezuela to Patagonia/Tierra del Fuego and two additional contributions. Lange-Bertalot, H. (ed. ), Iconographia Diatomologica. Annotated Diatom Micrographs. Vol. 9. Phytogeography-Diversity-Taxonomy. Koeltz Scientific Books, Königstein, Germany, 9:673 pp. Valves are small. The raphe is difficult to see in LM, but the proximal raphe ends are distinct thickenings placed at a distance from one another. Each stria is composed of a single elongate areola.